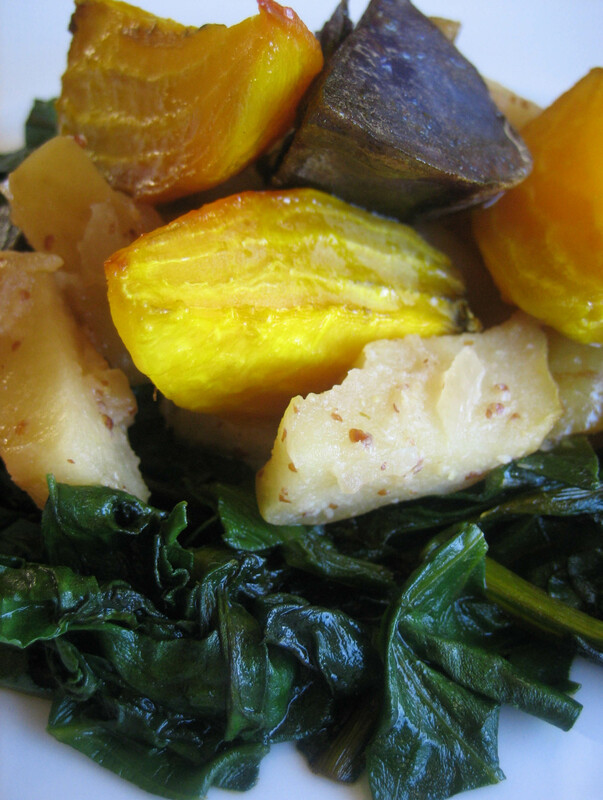 Sometimes nothing beats fresh roasted vegetables and greens for dinner. I saw these golden beets in the produce section with their tops still attached and I started to salivate. I promptly whisked them home and decided upon a very simple dinner with some warmed tart and tangy apples and Peruvian potatoes to accompany the beets. Sauté the onions and apples in a drizzle of olive oil until edges begin to caramelize. Add in 1/4 cup wine and cook off the alcohol. Add in the roasted garlic, mustard and splash in some apple cider vinegar. Cook for a few minutes to evaporate off the vinegar.